As the 10th anniversary of the 9/11 attacks approaches, a comprehensive public opinion survey finds no indication of increased alienation or anger among Muslim Americans in response to concerns about home-grown Islamic terrorists, controversies about the building of mosques and other pressures that have been brought to bear on this high-profile minority group in recent years. There also is no evidence of rising support for Islamic extremism among Muslim Americans. On the contrary, as found in the Pew Research Center’s 2007 survey, Muslims in the United States continue to reject extremism by much larger margins than most Muslim publics surveyed this year by the Pew Global Attitudes Project. 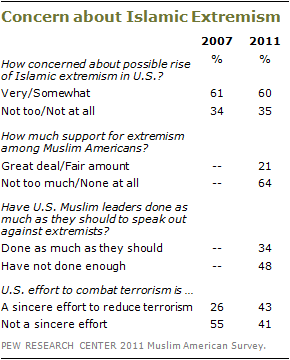 And majorities of Muslim Americans express concern about the possible rise of Islamic extremism, both here and abroad. A significant minority (21%) of Muslim Americans say there is a great deal (6%) or a fair amount (15%) of support for extremism in the Muslim American community. That is far below the proportion of the general public that sees at least a fair amount of support for extremism among U.S. Muslims (40%). And while about a quarter of the public (24%) thinks that Muslim support for extremism is increasing, just 4% of Muslims agree. Many Muslims fault their own leaders for failing to challenge Islamic extremists. Nearly half (48%) say that Muslim leaders in the United States have not done enough to speak out against Islamic extremists; only about a third (34%) say Muslim leaders have done enough in challenging extremists. At the same time, 68% say that Muslim Americans themselves are cooperating as much as they should with law enforcement. The survey of 1,033 Muslim Americans, conducted April 14-July 22 by the Pew Research Center for the People & the Press and the Pew Forum on Religion & Public Life, finds that far more view the United States’ efforts to combat terrorism as sincere than did so in 2007. Currently, opinion is divided – 43% of Muslim Americans say U.S. efforts are a sincere attempt to reduce terrorism while 41% do not. Four years ago, during George Bush’s presidency, more than twice as many viewed U.S. anti-terrorism efforts as insincere rather than sincere (55% to 26%). For Muslims in the United States, concerns about Islamic extremism coexist with the view that life for Muslim Americans in post-9/11 America is difficult in a number of ways. Significant numbers report being looked at with suspicion (28%), and being called offensive names (22%). And while 21% report being singled out by airport security, 13% say they have been singled out by other law enforcement. Overall, a 52% majority says that government anti-terrorism policies single out Muslims in the U.S. for increased surveillance and monitoring. However, reports about such experiences and feelings of being subject to intense scrutiny have not changed substantially since 2007. Overall about the same percentage today as in 2007 say that life for Muslims in the U.S. has become more difficult since 9/11 (55% now, 53% in 2007). The percentage reporting they are bothered by their sense that Muslim Americans are being singled out for increased government surveillance also is no greater now than four years ago (38% bothered a lot or some today vs. 39% in 2007). The controversies over the building of mosques in New York City and other parts of the country are resonating in the Muslim American community. Most Muslim Americans (81%) have heard about the proposal to build a mosque and Islamic center near the site of the World Trade Center and a clear majority of those who are aware of the planned mosque (72%) say it should be allowed. However, 35% say either that the project should not be allowed (20%), or that it should be permitted but is a bad idea (15%). A quarter of Muslim Americans (25%) report that mosques or Islamic centers in their communities have been the target of controversy or outright hostility. While 14% report that there has been opposition to the building of a mosque or Islamic center in their community in the past few years, 15% say that a mosque or Islamic center in their community has been the target of vandalism or other hostile acts in the past 12 months. Nonetheless, Muslim Americans have not become disillusioned with the country. They are overwhelmingly satisfied with the way things are going in their lives (82%) and continue to rate their communities very positively as places to live (79% excellent or good). At a personal level, most think that ordinary Americans are friendly (48%) or neutral (32%) toward Muslim Americans; relatively few (16%) believe the general public is unfriendly toward Muslim Americans. About two-thirds (66%) say that the quality of life for Muslims in the U.S. is better than in most Muslim countries. Strikingly, Muslim Americans are far more satisfied with the way things are going in the country (56%) than is the general public (23%). Four years ago, Muslim Americans and the public rendered fairly similar judgments about the state of the nation (38% of Muslims vs. 32% of the general public were satisfied). The current disparity may well reflect the fact that Muslim Americans are much more satisfied with the current political situation in the country than they were four years ago. Most Muslim Americans continue to identify with or lean toward the Democratic Party and they overwhelmingly support Barack Obama. Fully 76% approve of Obama’s job performance; in 2007, about as many (69%) disapproved of George Bush’s job performance. 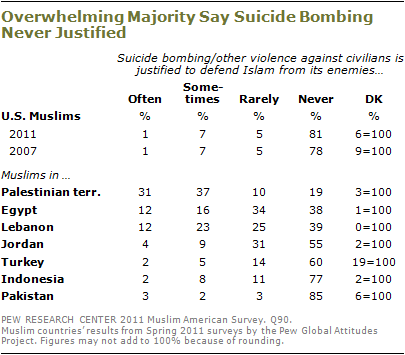 As in 2007, very few Muslim Americans – just 1% – say that suicide bombing and other forms of violence against civilian targets are often justified to defend Islam from its enemies; an additional 7% say suicide bombings are sometimes justified in these circumstances. Fully 81% say that suicide bombing and other forms of violence against civilians are never justified. A comparably small percentage of Muslim Americans express favorable views of al Qaeda – 2% very favorable and 3% somewhat favorable. And the current poll finds more Muslim Americans holding very unfavorable views of al Qaeda than in 2007 (70% vs. 58%). There is much greater opposition to suicide bombing – and more highly negative views of al Qaeda – among Muslims in the United States than among Muslims in most of the seven predominantly Muslim countries surveyed by the Pew Global Attitudes Project. In the Palestinian territories, 68% of Muslims say suicide bombing and other forms of violence are at least sometimes justified, as do 35% of Muslims in Lebanon and 28% of those in Egypt. Opposition to violence is broadly shared by all segments of the Muslim American population, and there is no correlation between support for suicide bombing and measures of religiosity such as strong religious beliefs or mosque attendance. Yet opposition to extremism is more pronounced among some segments of the U.S. Muslim public than others. Overall, just 5% of Muslim Americans express even somewhat favorable opinions of al Qaeda. Yet hostility toward al Qaeda varies – 75% of foreign-born U.S. Muslims say they have a very unfavorable opinion of al Qaeda, compared with 62% of all native-born Muslims and 56% of native-born African American Muslims. However, the proportion of African American Muslims expressing very unfavorable opinions of al Qaeda has increased from 39% four years ago. Perhaps relatedly, 40% of native-born African American Muslims believe that there is at least a fair amount of support for extremism among U.S. Muslims, compared with just 15% among foreign born Muslim Americans. A majority of Muslim Americans (56%) say that most Muslims who come to the U.S. want to adopt American customs and ways of life; just 20% say that Muslims in this country want to be distinct from the larger American society. In contrast, just a third (33%) of the general public believes that most Muslims in the U.S. today want to assimilate. Moreover, only about half of U.S. Muslims (48%) say that most of their close friends are Muslims, and just 7% say that all their close friends are Muslims. These figures are little changed from 2007. Nearly three-quarters (74%) of Muslim Americans endorse the idea that most people can get ahead if they are willing to work hard; just 26% say hard work is no guarantee of success. Among the general public, somewhat fewer (62%) say that most people who work hard can get ahead. U.S. Muslims are about as likely as other Americans to report household incomes of $100,000 or more (14% of Muslims, compared with 16% of all adults), and they express similar levels of satisfaction with their personal financial situation. Overall, 46% say they are in excellent or good shape financially; among the general public, 38% say this. Muslim Americans are as likely as the public overall to have graduated from college (26% of Muslims vs. 28% among the general public). Because as a group Muslim Americans are younger than the general public, twice as many report being currently enrolled in a college or university class (26% vs. 13%). Similar numbers of Muslim Americans and members of the general public report being self-employed or owning a small business (20% for Muslim Americans, 17% for the general public). 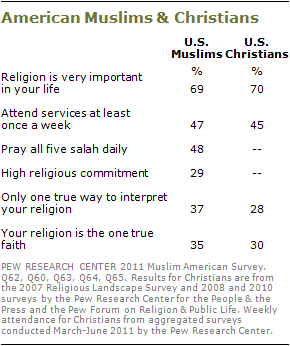 When it comes to many other aspects of American life, Muslim Americans look similar to the rest of the public. Comparable percentages say they watch entertainment television, follow professional or college sports, recycle household materials, and play video games. About one-in-three (33%) say they have worked with other people from their neighborhood to fix a problem or improve a condition in their community in the past 12 months, compared with 38% of the general public. W hen asked to choose, nearly half of Muslims in the U.S. (49%) say they think of themselves first as a Muslim, while 26% see themselves first as an American; 18% volunteer that they are both. In a 2011 survey by the Pew Global Attitudes Project, 46% of Christians in the U.S. say they identify as Christian first while the same number identify as American first. White evangelicals are much more likely to identify first as Christian (70%). The survey also finds that compared with Muslims elsewhere, Muslim Americans are more supportive of the role of women in society. Virtually all Muslim Americans (90%) agree that women should be able to work outside of the home. Most (68%) also think that there is no difference between men and women political leaders. These are not the prevailing views of Muslims in most predominantly Muslim countries surveyed by the Pew Global Attitudes Project. And on a key foreign policy issue, Muslim Americans are far more likely than Muslims in the Middle East to say that a way can be found for the state of Israel to exist so that the rights of the Palestinians are addressed (62% say this; 20% disagree). In this regard, the views of Muslim Americans resemble those of the general public, among whom 67% say a way can be found for the state of Israel to exist while protecting the rights of the Palestinians; 12% disagree. A 63% majority of Muslim Americans are first-generation immigrants to the U.S., with 45% having arrived in the U.S. since 1990. More than a third of Muslim Americans (37%) were born in the U.S., including 15% who had at least one immigrant parent. Despite the sizable percentage of immigrants, 81% of Muslim Americans are citizens of the U.S., including 70% of those born outside the U.S. This is a much higher rate of citizenship among foreign-born Muslims than among the broader immigrant population in the U.S.; 47% of all foreign-born are citizens. First-generation Muslim Americans come from a wide range of countries around the world. About four-in-ten (41%) are immigrants from the Middle East or North Africa, while about a quarter (26%) come from South Asian nations including Pakistan (14%), Bangladesh (5%) and India (3%). Others came to the U.S. from sub-Saharan Africa (11%), various countries in Europe (7%), Iran (5%), or other countries (9%). Among the roughly one-in-five Muslim Americans whose parents also were born in the U.S., 59% are African Americans, including a sizable majority who have converted to Islam (69%). Overall, 13% of U.S. Muslims are African Americans whose parents were born in the United States. A 55% majority of Muslim Americans are married, comparable to 54% among the U.S. general public. Most Muslim Americans (83%) are married to someone of their own faith, as is the case generally in the U.S. For example, among married U.S. Christians, 92% are married to a Christian. Muslim Americans have liberal attitudes on a number of current political issues. A substantial majority (68%) says they would rather have a larger government providing more services than a smaller government providing fewer services. That compares with 42% of the general public. Most Muslim Americans (70%) either identify as Democrats (46%) or lean toward the Democratic Party (24%); just 11% identify with the Republican Party or lean toward the GOP. Nearly half of Muslim Americans (48%) say they feel that the Republican Party is unfriendly toward Muslim Americans; just 15% say the party is friendly toward them. By contrast, 46% say the Democratic Party is friendly toward Muslim Americans, and 64% feel that way about Barack Obama. Among Muslim Americans who say they voted in 2008, an overwhelming 92% say they voted for Obama. In comparison, the 2007 survey found that 71% reported voting for Democrat John Kerry in the 2004 election. One issue on which Muslim Americans do not stand out as especially liberal is on societal acceptance of homosexuality. About as many Muslim Americans say homosexuality should be discouraged by society (45%) as accepted by society (39%). The general public, by a 58% to 33% margin, says that homosexuality should be accepted. Still, there is greater support for societal acceptance of homosexuality, among both U.S. Muslims and the public, than there was a few years ago. In 2007, Muslim Americans, by more than two-to-one (61% to 27%), said homosexuality should be discouraged. Perhaps not surprisingly, Muslim Americans have a far more positive view of immigrants than does the public generally. About seven-in-ten (71%) say that immigrants today strengthen the country with their hard work and talents; just 22% say that immigrants are a burden because of their impact on the availability of jobs, housing and health care. The general public is evenly divided on this question; 45% say that immigrants strengthen the country, while 44% say immigrants are a burden. Many Muslim Americans are highly religious: 69% say that religion is very important in their lives, and about half (47%) report at least weekly attendance at a mosque for prayer. Similarly, about half (48%) say they make all five salah prayers daily, and another 18% report making at least some salah daily. By these measures, Muslims in the U.S. are about as religious as Christians in the United States: 70% of Christians say that religion is very important in their lives and 45% attend services at least weekly according to recent surveys by the Pew Research Center for the People & the Press. Overwhelming numbers of Muslim Americans believe in Allah (96%), the Prophet Muhammad (96%) and the Day of Judgment (92%). Yet the survey finds that most reject a dogmatic approach to religion. Most Muslim Americans (57%) say there is more than one true way to interpret the teachings of Islam; far fewer (37%) say that there is only one true interpretation of Islam. Similarly, 56% of Muslim Americans say that many different religions can lead to eternal life; just 35% say that Islam is the one true faith that leads to eternal life. In this respect, Muslim Americans differ from many of their counterparts in the Muslim world and are similar to U.S. Christians. In the Pew Forum on Religion & Public Life’s 2007 U.S. Religious Landscape Survey, 28% of Christians said that there was only one way to interpret the teachings of their religion. The 2011 Muslim American Survey is based on telephone interviews conducted April 14-July 22, 2011 with 1,033 Muslims in the U.S. Interviews were conducted in English, Arabic, Farsi and Urdu. The survey was conducted by landline telephones and cell phones, using a nationally representative random sample combining interviews from three sampling sources. (1) About a third (35%) of the interviews (358) were obtained from a geographically stratified random-digit-dial (RDD) sample of the general public, which entailed screening 41,689 households. (2) An additional 501 came from a commercial database of 113 million households, of which more than 600,000 included people with likely Muslim first names or surnames who also had a telephone number; Muslim households from this database were excluded from the geographically-stratified RDD sample but were included in a separate stratum as part of the general public RDD sample. (3) An additional 174 interviews were obtained by recontacting English-speaking Muslim households on landlines and cell phones from previous nationwide surveys conducted since 2007. The results of all three sampling sources were combined and statistically adjusted to the demographic parameters of the Muslim population, as estimated by the results of the interviews from the geographically-stratified RDD and listed sample (excluding the recontact interviews). The margin of sampling error for results based on the full sample is plus or minus 5 percentage points. Details about the study’s sample design and the overall methodological approach are contained in the survey methodology. The study’s design was nearly identical to that used in the 2007 survey of Muslim Americans.